While it is It is evident the 2030 Agenda is being increasingly used as the framework for improved national development plans around the world, “we are far from where we need to be,” the President of the United Nations General Assembly said today, opening the 193-member body’s annual general debate with a strong call to do more to end conflict, erase poverty and bolster human rights for all. 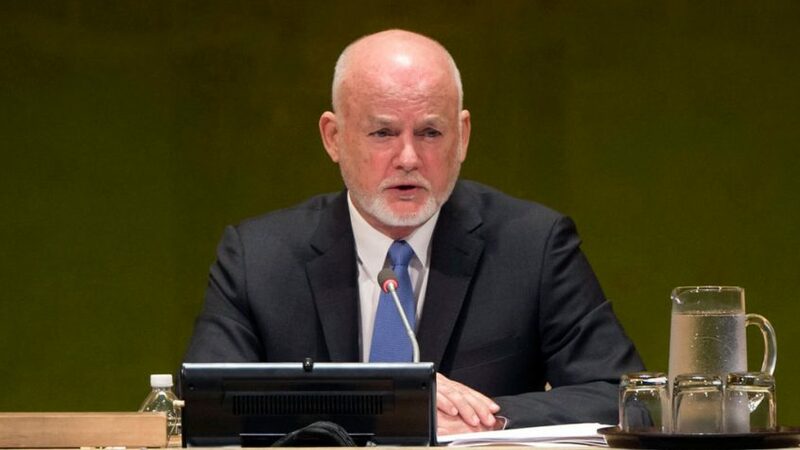 Even as he hailed the progress made in implementing the year-old Sustainable Development Goals (SDGs), which he called a “transformative masterplan,” and the adoption of the Paris Agreement on climate change, Peter Thomson noted that millions of people around the globe are suffering the brutal effects of war. Indeed, the crisis in Syria continues to bring immense human suffering to the country’s people; both for those who have fled in search of sanctuary and those who have stayed under inhumane conditions. “I strongly condemn the attacks on a UN aid convey, seeking to bring desperately needed food and medical supplies to people in need. The deliberate targeting of humanitarian personnel is a flagrant violation of international law, and totally morally unacceptable,” he said. Among other global ills, the Assembly President noted that more than 60 million people are on the move, many risking their lives to flee conflict and disaster; week after week, innocent people are falling victim to despicable acts of violent extremists; and the gap between rich and poor; between women and men; and between developing countries and advanced economies, remains stubbornly high. Moreover, at a time when collaboration and partnership are needed more than ever, the international community is witnessing rising xenophobia, divisive rhetoric, and attacks on our human rights and fundamental freedoms. Meanwhile, global greenhouse gas emissions continue to rise; incredible damage is being done to our oceans and seas; and the window of opportunity to avert catastrophic climate change is rapidly closing. “We need to teach our young people about the SDGs, because for the required transformation to occur, it must first take hold in our minds and in our values. It is our children who will be the inheritors of the Agenda’s results, so every classroom around the world should be teaching the Sustainable Development Goals,” he said, encouraging the delegations present to achieve this reality. He went on to say that greater public resources must be dedicated to achieving the SDGs, either directly through domestic finance, or through official development assistance (ODA), such as climate finance. He also called for better regulatory environments, and to require the international financial system to ensure finance is increasingly focused on productive, green and socially responsible investment. “Strategic and inclusive partnerships must be forged to meet the global challenges we face – from climate change to conflict, from violent extremism and terrorism to the contagious diseases that threaten our kind” he said, pledging that as President of the 71st UN General Assembly, he would support Member States in addressing those issues and is committed to a universal push for implementation of all 17 SDGs. Encouraging UN work practices that are flexible, innovative, and coherent; and making the UN more effective, efficient, accountable, and fit for purpose.